From the blog of Cary Mayor Harold Weinbrecht, covering the week through March 18, 2012. Photo courtesy of IBA. Cary, NC – This was a busy week for me with a lot of events and a lot of late nights. Sunday afternoon I attended the spectacular performance of the International Ballet Company and the Philharmonic Association. 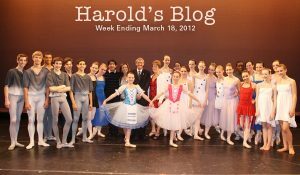 This ballet company is putting Cary on the map by winning national competitions and giving these wonderful performances. The ballet company is run by some of the best teachers in the county and lead by world renowned Miguel Campaneria. We are blessed to have them here in Cary.